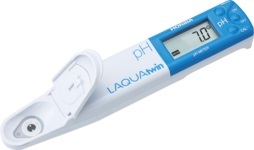 The only pocket meter that directly measures pH in 0.1ml sample (or 0.05ml sample with sampling sheet B). Unique sensor allows measurement of viscous liquids, solids, and even powder samples. No need for a beaker to calibrate your meter or measure a sample. Just place few drops of the standard or sample onto the flat sensor. This procedure saves you time and prevents wasting your precious sample.